Do not miss an opportunity to swim with our Pacific Bottlenose Dolphins at our state-of-the-art marine mammal facility in Cabo San Lucas. Interacting with these remarkably intelligent and charming creatures in their natural environment of a saltwater lagoon will be the highlight of your vacation to Los Cabos. Our professional English fluent animal trainers are waiting to guide you on this amazing interaction with one of the most brilliant and friendly animals on the planet. Our trainers will teach you all there is to know about these remarkable cetaceans before hitting the pool where you will swim with one of these fascinating animals. Our trainers will instruct you how to communicate with these brilliant animals through hand gestures. You can direct them to perform dazzling acrobatic tricks. You will be astonished by the Pacific Bottlenose Dolphins' speed, power, and athletic ability as they maneuver around you in the lagoon. You will have the chance to physically touch the dolphins; pet their bellies, and give them a hug as well as a gentle dolphin kiss. These delightful marine mammals have a long and storied history of interacting with human beings in the wild. They are often seen following along with sea vessels, leaping out of the water and surfing in the wake. There are plenty of stories of these helpful animals coming to the aid of sailors in distress. 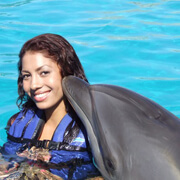 Continue this age-old relationship between Bottlenose Dolphins and people, by swimming with one of these enchanting animals while you are vacationing in the resort paradise of Cabo San Lucas. Our modern Cabo San Lucas Dolphin Facility, located in the Cabo Marina, awaits you and your family. Enjoy the once-in-a-lifetime opportunity to encounter one of the smartest and pleasant creatures of the animal world, the Pacific Bottlenose Dolphin. 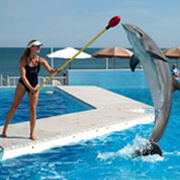 If you are interested in marine mammals and animal behavior, youll really enjoy our Cabo Dolphin Trainer for a Day Program while visiting Cabo San Lucas. 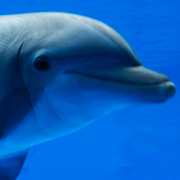 Training aquatic mammals, such as Pacific Bottlenose Dolphins is a once in a lifetime experience.